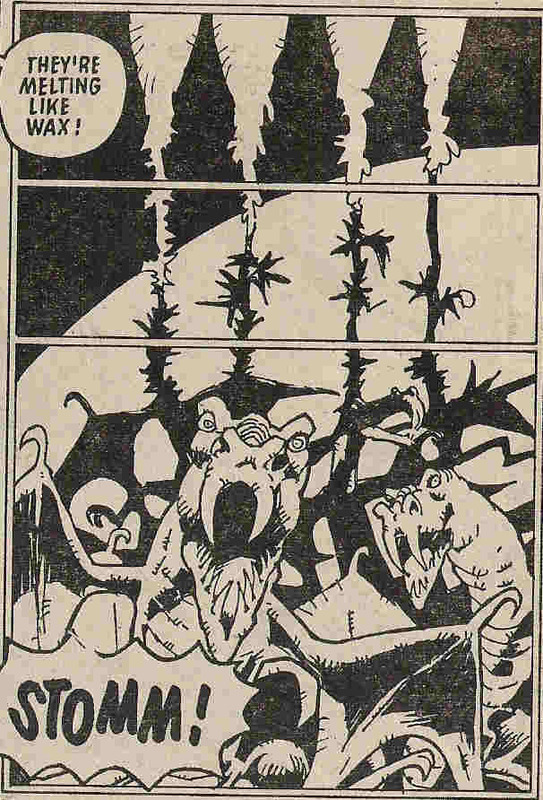 -not including the utterly incomprehensible, and never completed Muto Maniac from Toxic!. All 5 original VCs both in and out of costumes, and the Geeks, too. Lines everywhere, and plenty of ink - exceptwhen there isn't. Increasingly stylized character design. Flattening. Clothing definition. For an artist with an increadibly recognisabel style, I'm really struggling to pick out defining features aren't I! Michael ‘Mike’ ‘Mick’ (he uses Mick on his own website, and that’s good enough for me!) McMahon is one of 2000AD’s all time art legends. Pretty much everyone raves about his work, and only has nice things to say about the man himself, too. I’m not going to deviate from those opinions, but I am going to come at the legend from a different angle. Because it’s the only way I know how! 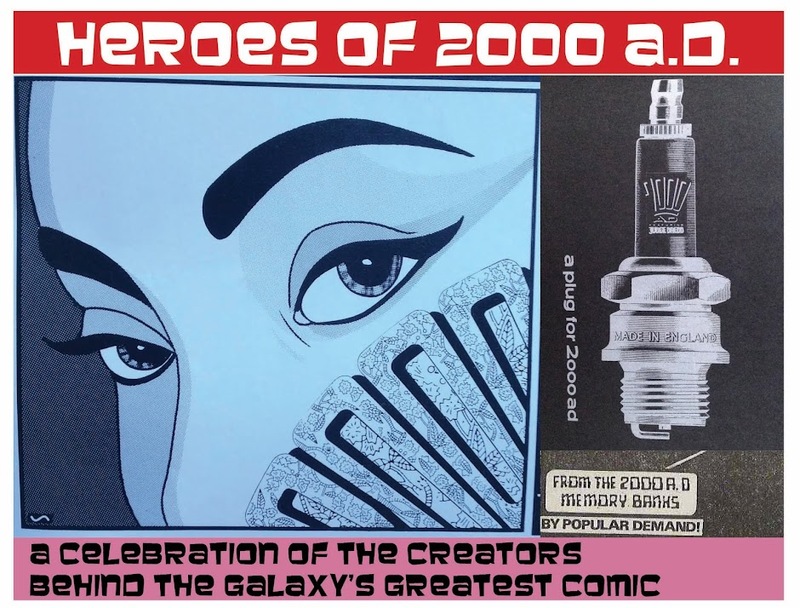 It was a very similar reaction to my first exposure to Jack Kirby, another universally-beloved comics legend, when I first saw reprints of his Fantastic Four and Avengers work. “This is weird and blocky and crude” was the general tenor of my thoughts. Same for McMahon, only substitute ‘blocky’ for ‘scratchy’. Young me was clearly an idiot. Or, to be charitable, was more interested in comics art as only about storytelling, and not bothered about comics art as actual art. An argument can certainly be made that McMahon’s very first strips for 2000AD were pretty crude, but they were brimming with zest, movement and that tang of weirdness that permeates the best of 2000AD art. Functional monsters, but also so much more! 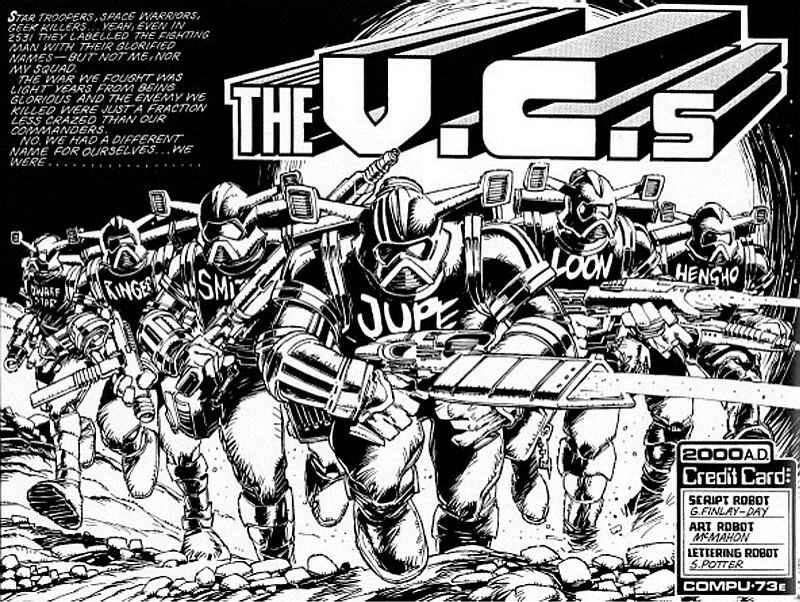 The story goes that McMahon was commissioned, at first, to draw in the style of Dredd-creator Carlos Ezquerra. Which he duly did – but fairly soon developed his own style, which he has refined, exaggerated and generally reinvented many times since. And, in fact, his storytelling skills were pretty good at the start – it’s just that he pretty quickly seemed to be interested in using his pages to draw some sneaky fine art in amongst the story. Storytelling success, but so much more - the poses, the detail on the toad skin, the funky v-headed alien design, the brickwork! 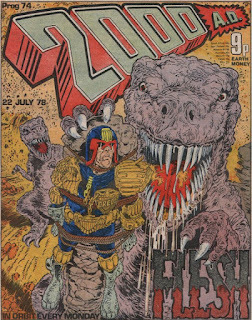 As well as moulding Dredd’s helmet as if it was made of clay, McMahon treated readers to increasingly gigantic boots, and an array of sneering, snarling, and gleefully unkempt bad guys. 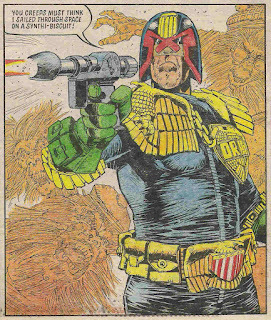 Especially impressive was Rico Dredd, a man with so much invasive medical chicanery on his face, all other artists since have chosen to dial it back. 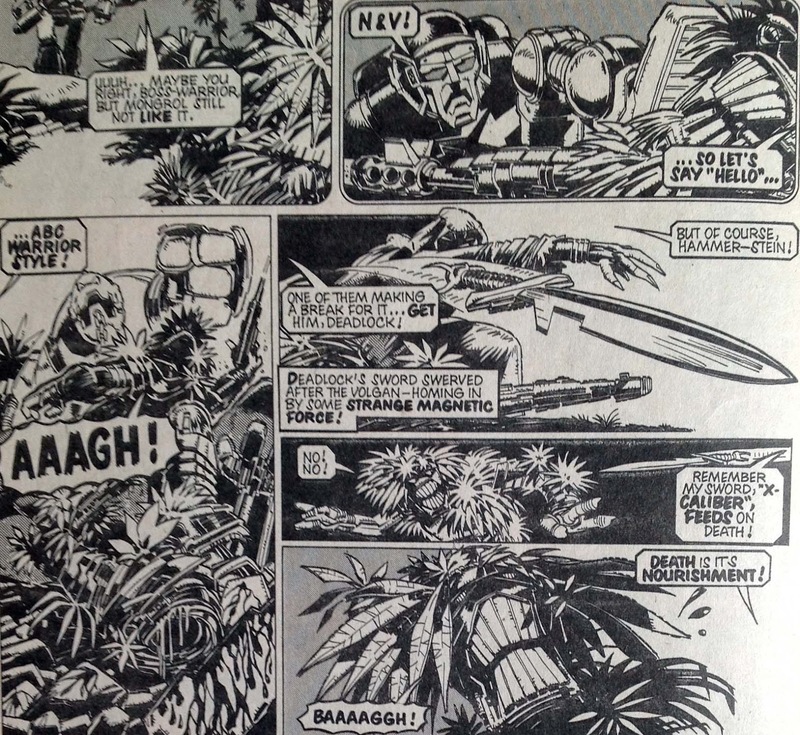 McMahon was far and away the most prolific Judge Dredd artist for the first few years, and across the span of his work on the character between Prog 2 and Prog 196 (and one episode of Block Mania a good bit later), you can see his style develop and refine enormously. 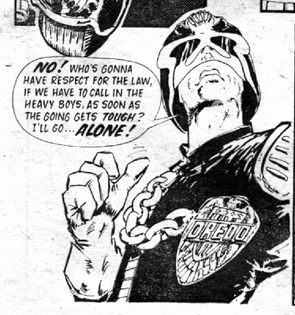 Dredd gets wider; helmet now a semi-circle. 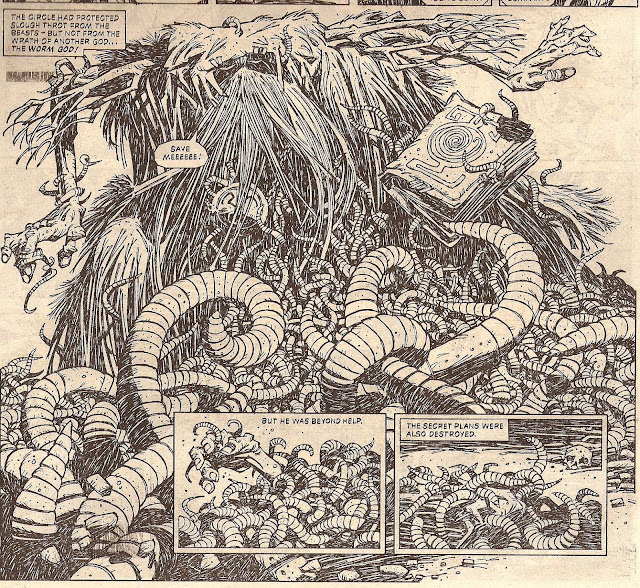 His art seems to work sometimes by sheer force of will – huge numbers of lines and great swathes of ink - but at the same time, very deliberate use of space and occasionally using very little brushwork to convey a lot. Hair, wrinkles on faces and clothes, shadows falling, all meticulously picked out on the page. All in service to the story, but, like the best comics artists, there’s the pure pleasure of a drawing in there nearly every time. At a certain point he seemed to be into shiny patches on round surfaces, from elbows, chins and noses to gleaming metal robots. 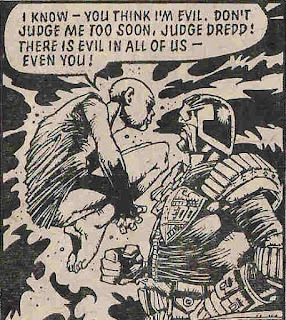 He also came to do an absolutely fantastic line in the various forms of evil, whether it’s the pure evil of the devil, or the vacant evil of the psychopath, or the more subtle evil of someone like Dredd, who hides behind his stubborn obsession with the law to sidestep moral quandaries, and even the naïve evil of Slaine, who resorts to violence and trusts in his beliefs without ever stopping to think about them much. But I’m getting ahead of myself! 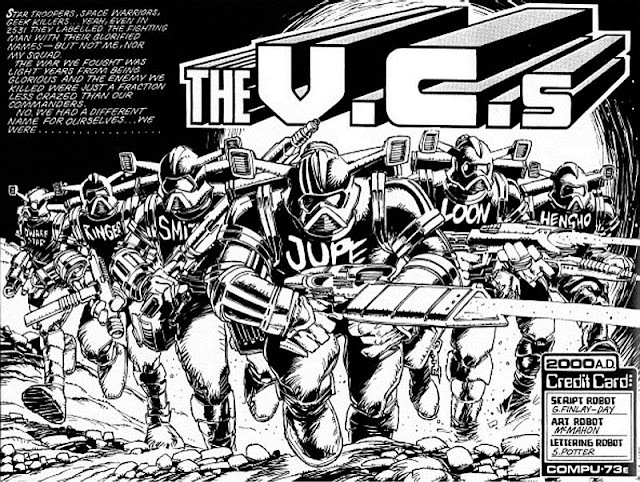 Before McMahon’s fantastical adventures, he had fun with Ro-Busters, the ABC Warriors, and paused briefly to dash off episode one of the VCs, designing a wealth of new characters, spaceships and crazy-looking spacesuits. 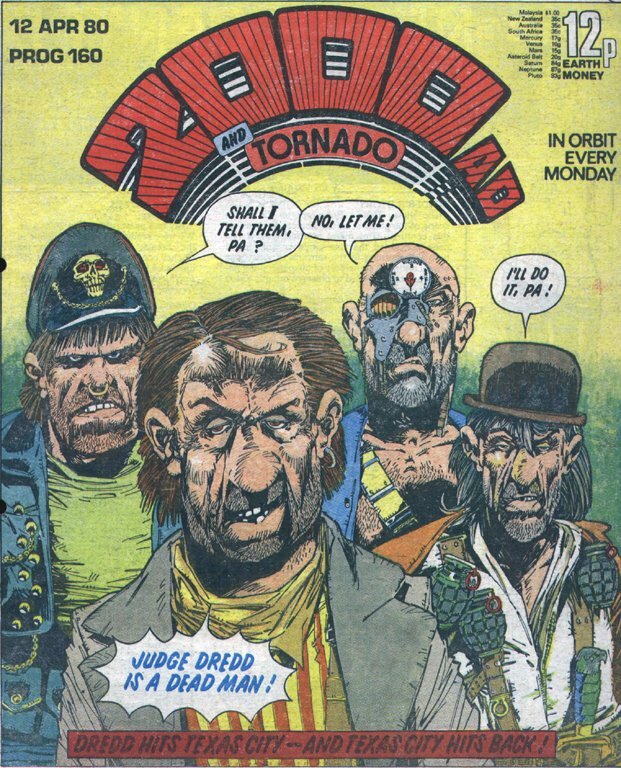 Masterful stuff – although I think it did make sense for the more hard-action stylings of Kennedy and Leach to see through the series proper. 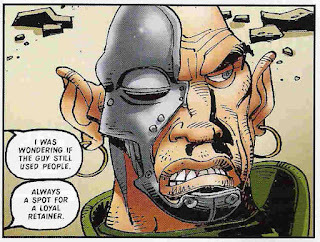 McMahon’s work on the ABC Warriors in particular really cemented something that I think of as a grounded, earthy quality to his work. When you’re depicting futuristic robots and still make everything look grimy, broken and lived-in, it really brings home the sense of realness, for want of a better word. Obviously this went to a whole new level with Slaine, the Earth Warrior. McMahon seemingly filled the page with black ink and scratched away at it to reveal the pictures hidden within*. And what pictures! Again, 8-year-old me was left a bit cold. Why didn’t Slaine look normal? What’s with all the exaggerated limbs? 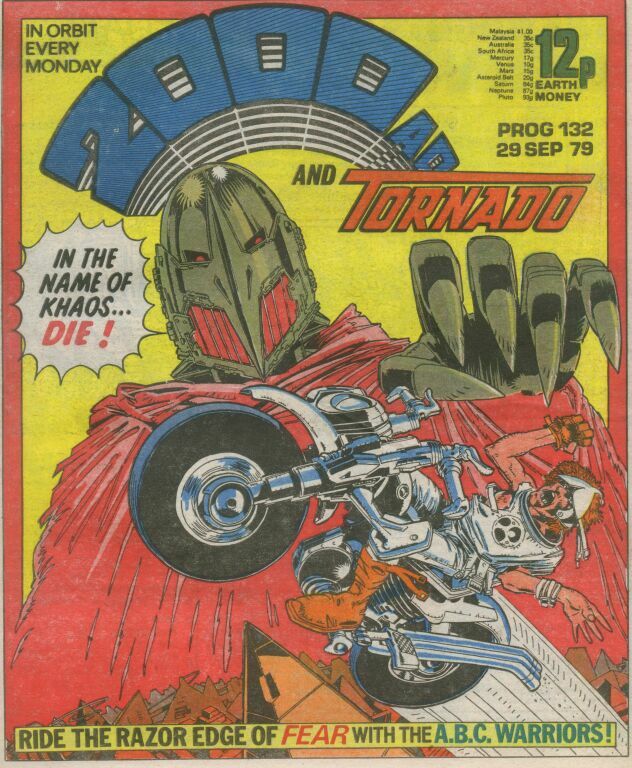 But with more mature eyes it’s amongst the very best art ever printed in the Prog. Living forests of fear. 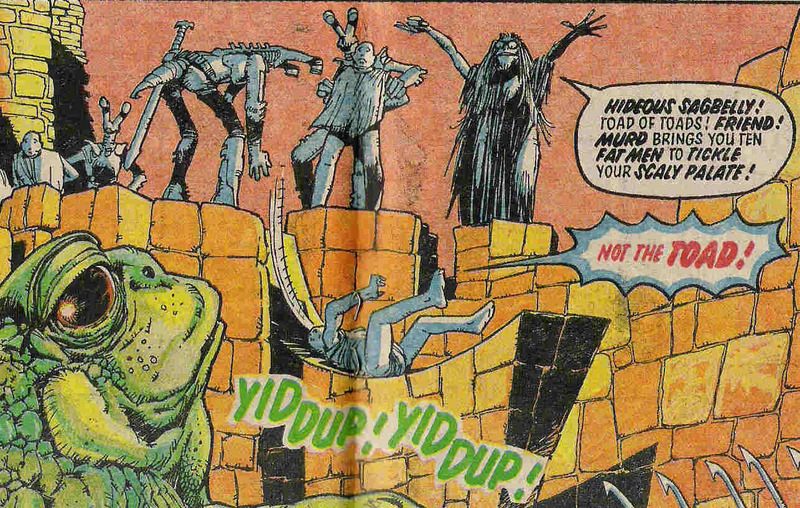 Maggoty druids, wracked with their own guilt. Flying ships full of angry Vikings, for goodness’ sake! 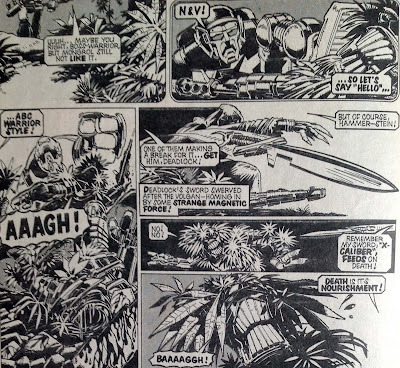 Best death scene in 2000AD? Gotta be a contender. 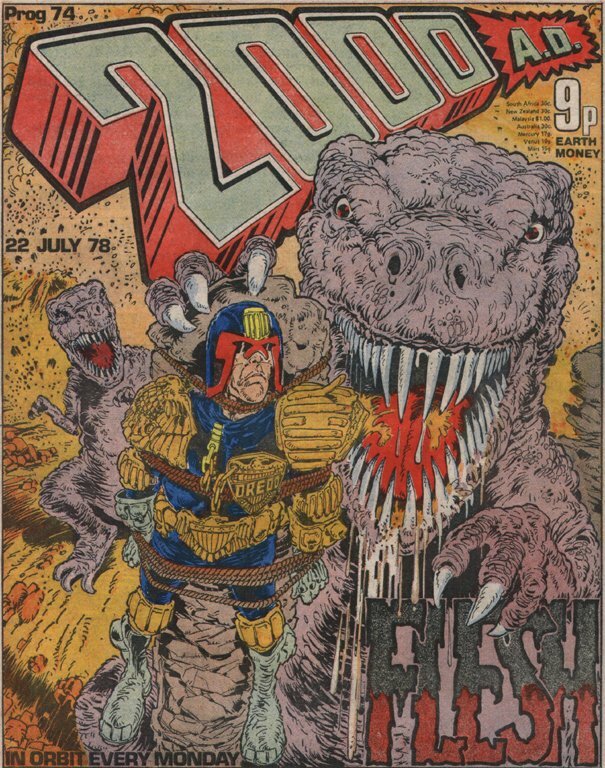 And for a long while, that seemed to be that – no more McMahon** for years and years, until the Megazine loudly hailed his return to the fold. Now in colour, McMahon’s style was as different again from his Slaine work as that had been from his earlier Dredds. 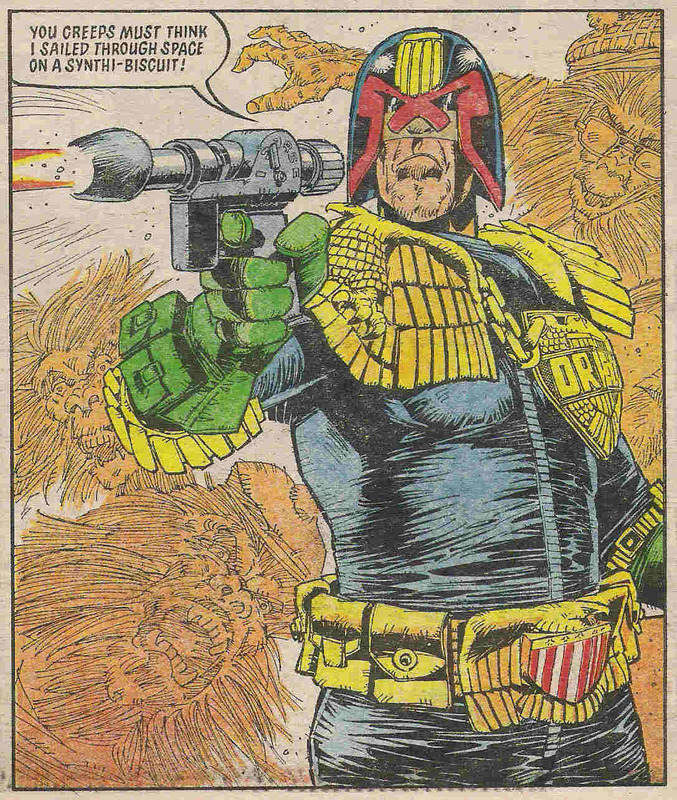 And yet, you can still see the same basic McMahon-iness in the characters, the poses, and the striving to tell a story and draw some goddamn art, too. 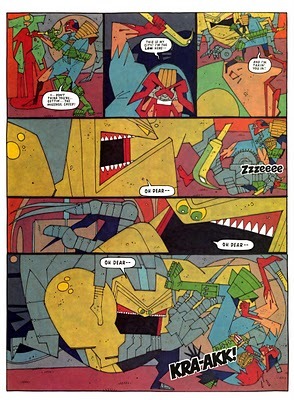 I don’t know if his work on Howler, and the handful of Judge Dredd work that followed, is actually straight-up cubism, but it’s clearly not far from that world (with a hint of futurism thrown in as regards his love of chunky lines of solid colour?). 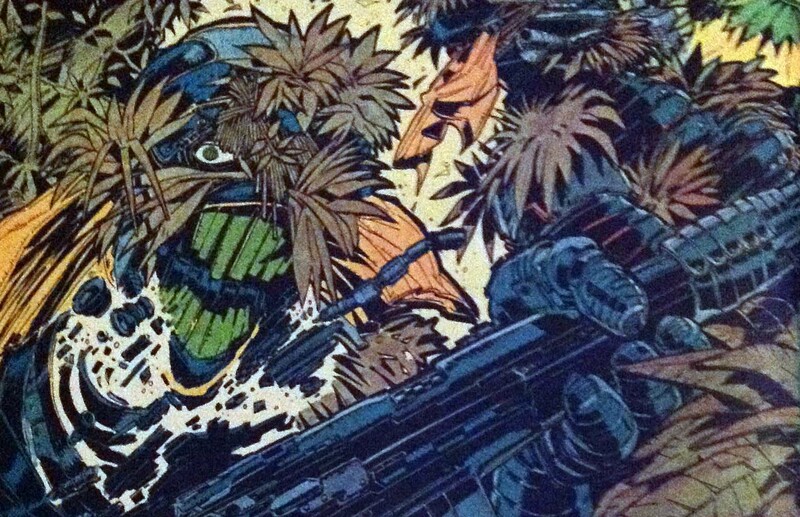 If there’s something noticeably different about his recent work, for me it’s the random background details. 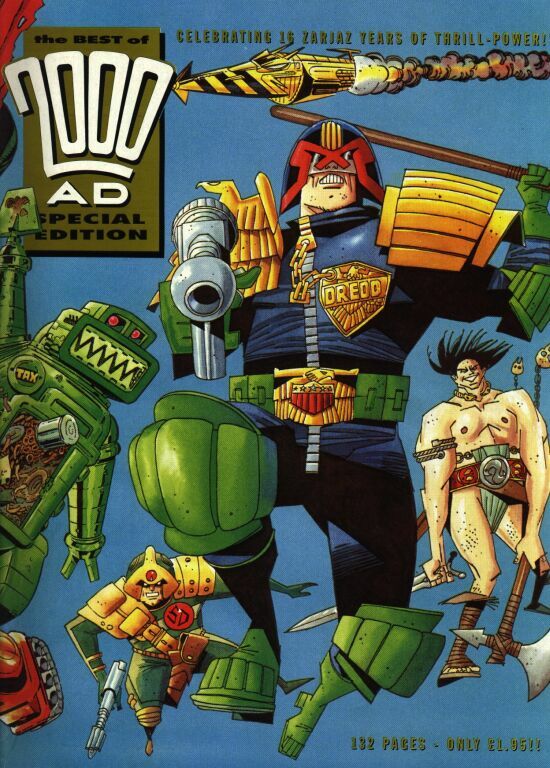 The Mega Citizens just loafing along while Dredd busts perps. 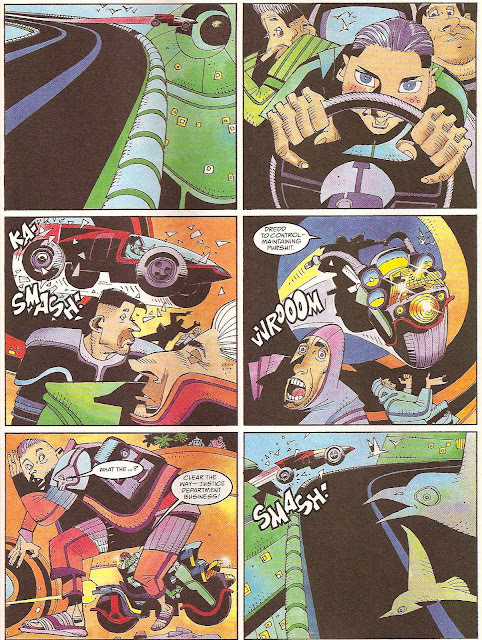 I suppose there’s also a lot more overt thinking going on in the panel construction, the deliberate positioning of people and characters at certain angles that speaks as much to questions of form and style as it does to ‘what’s going on in this part of the story’. Tripods run rampant on Mars. Innocent bystanders get killed. Still the same characters, but as you've never seen them before! That's what I call composition! *A simulation of woodcut technique, or did he actually do woodcutting and then print from that? Someone probably knows. *pssst* Block Mania, not Black Mania! Regarding his Sláine technique - I'm sure I read somewhere that in preparing one of the pages he noticed the scribbled in black areas on a piece of tracing paper, prior to transferring to art board and decided to go with that tribal style instead. 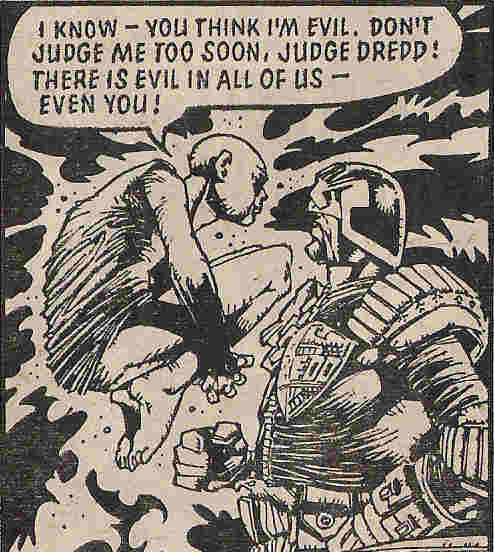 Judge Dredd in 'Black Mania' would be quite the story! Thanks for spotting that, and for the info about McMahon's Slaine technique. Hi there. 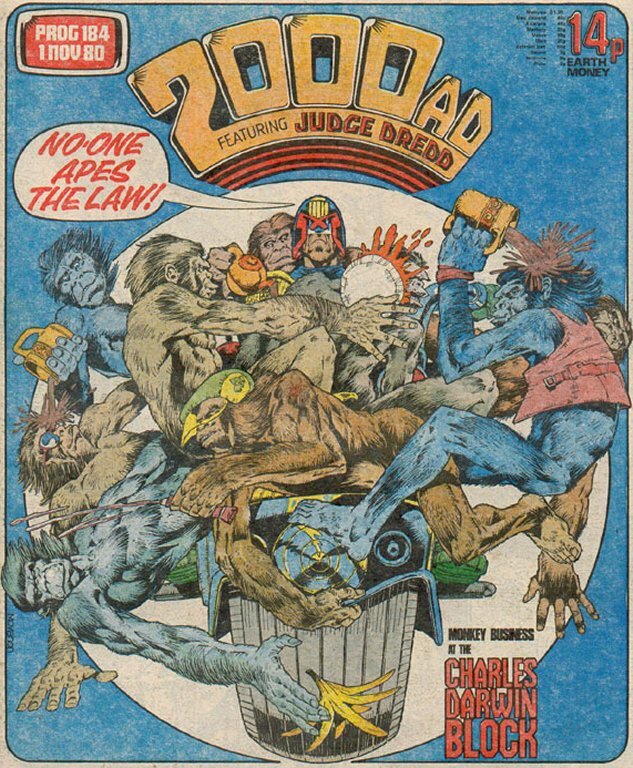 Just thought you might be interested in the two part interview with Mick on the 2000ad podcast. He is so damn entertaining that I wish he'd do his own podcast. It's interesting you should mention Jack Kirby, because McMahon's audacious stylisation in 'Howler' reminds me very much of the trajectory in Kirby's art, from the realistic pulp-illustration of the early 60s to the pure exaggeration of the late 70s.